The clippings are from (top to bottom) The Pittsburgh Press (9/15/81), The Pittsburgh Press (11/10/81), New Hampshire’s Nashua Telegraph (3/12/82), Pittsburgh Post-Gazette (5/15/82), Utah’s Deseret News (9/29/83), Florida’s Sarasota Herald-Tribune (7/1/84), and The Milwaukee Journal (7/16/85). 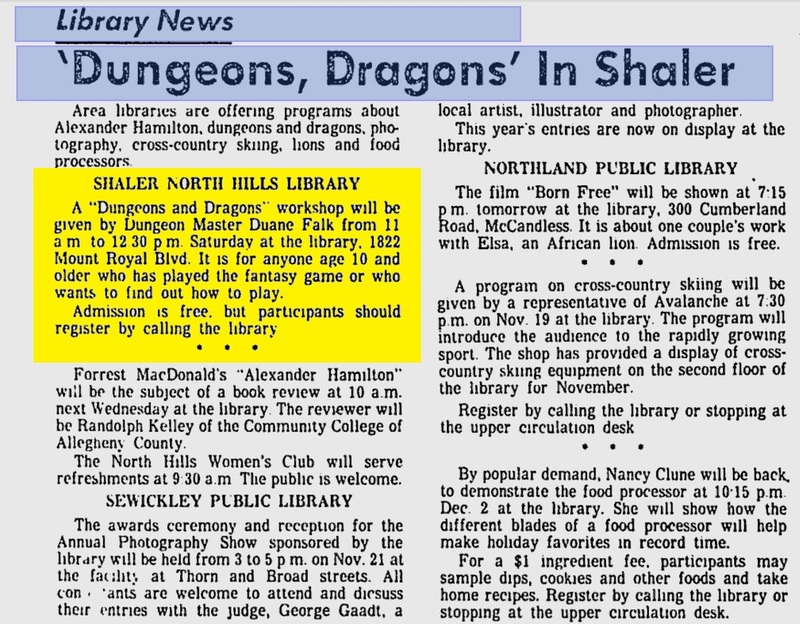 Certainly not an exhaustive list of ongoing D&D events sponsored by public institutions, but the narrative told in just these few cases is interesting enough. (I’ve mentioned D&D in science museums here and here). In the midst of all the nonsense spouted about the game, most adults managed to keep an even head about it. My parents didn’t understand how it worked or why I found it so enthralling, but they trusted me enough to let me play, and, if I felt it was necessary, to stop playing. That’s what’s changed. It wasn’t the Religious Right that killed all the quality, kid-friendly events and institutions of the ’70s and ’80s (arcades, youth centers, public playgrounds, roller rinks, summer camp, etc. ), it was helicopter parents and their distrust (overprotection is a form of distrust) of their own children. If kids aren’t allowed to hang out by themselves with other kids, then all the fun places for kids get shut down, and they’re left thinking Angry Birds and Facebook are as good as it gets. We need more places—more physical spaces—for kids to inhabit so that they can develop their own communities, languages, ideas, and rules. Otherwise, they’re never going to grow up. And they’re never going to understand what fun really is. How does one qualify to be a “dragon master,” by the way? No one else wants to do it. Every person falls into their role within a group. It’s like asking how someone became a right fielder or a goaltender. Argh, don’t even get me started on the direction of today’s youth…sigh. On a happier note, I’m happy to see the words Model Rocketry as the first class mentioned in Buhl’s summer courses. 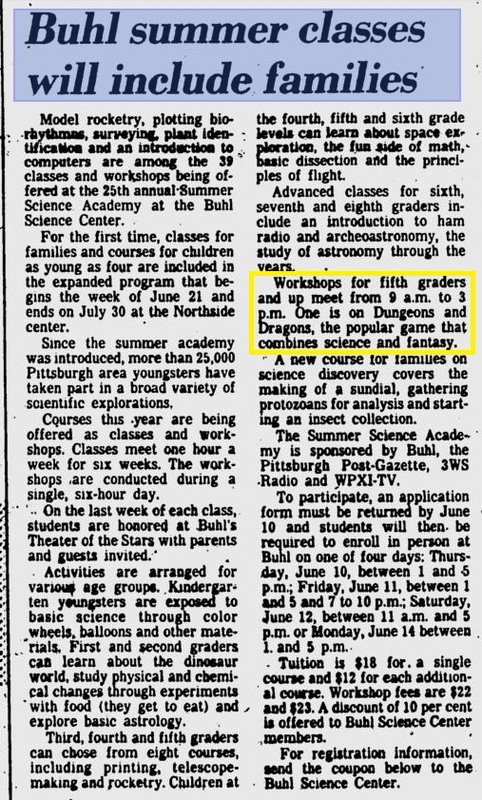 Oh, and after D&D, there was a family course on science discovery which included the collecting of protozoans (among my favorite creatures)…why oh why wasn’t I in Buhl at the time? 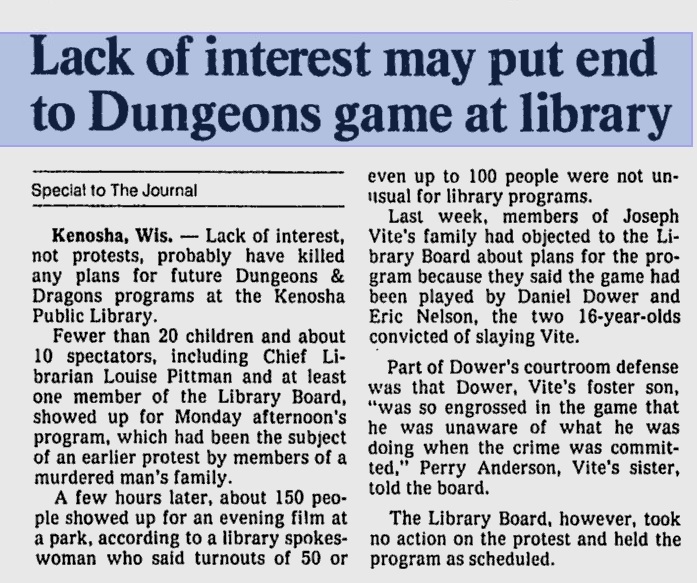 Anyways, I found an NBC article on Joseph Vite which I read to get some background on the murder. 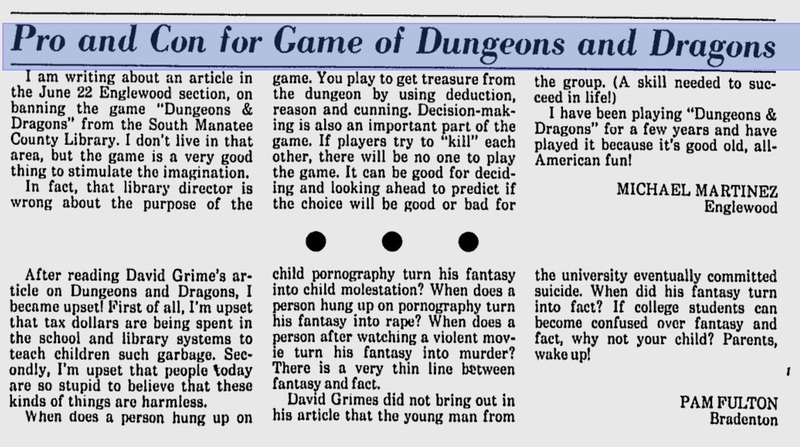 We may never know the real truth behind the motive, but at least in no part does the man say that D&D made him do it. So it was Dower then? Hmm. I found it kinda odd that there was mention of child abuse, yet no mention of any investigative effort to see if it indeed happened. Vite appeared to be a “nice guy” etc. but some things aren’t always as they seem.